Brazilian artist Adriana Varejão is known for paintings that have a sinister edge; visceral, trompe l’oeil works that appear to devour themselves before your eyes, smooth, tiled surfaces slashed to reveal carnal interiors. 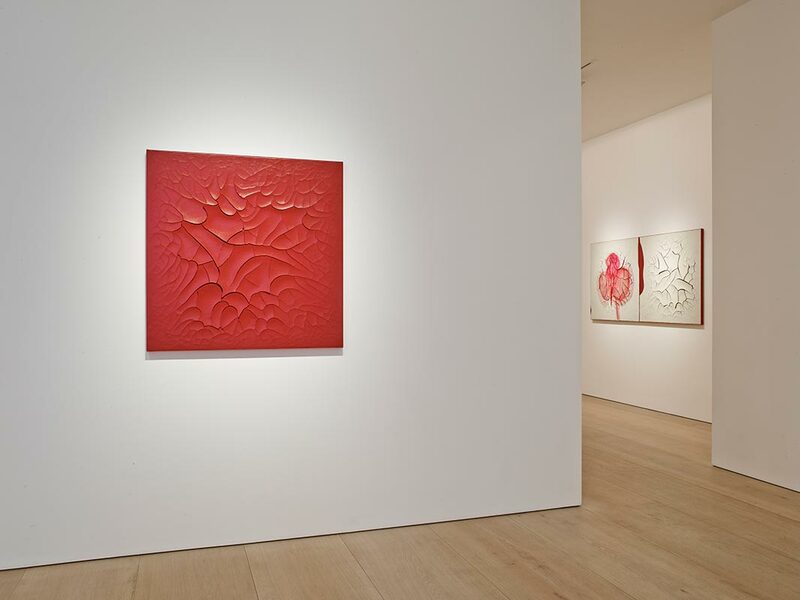 This latest show of work at Victoria Miro’s sleek new Mayfair space continues in this vein, as Varejão turns her attention to carnivorous plants found in botany encyclopaedias. Anaemic green and sickly sweet red dominate and connect the paintings, which are gathered in uneven groups around the gallery. Like shadows projected onto sun-baked ground, menacing silhouettes of venomous plants with prying tendrils fall over sculptural canvases, ragged with exaggerated cracklure. The deep fissures reveal blood coloured interiors, which seem to seep through the surfaces, soaking the edges of several, and saturating one, Carnivorous Red, with a rich intensity. The cracks, which are a recurring motif in Varejao’s work, are partly inspired by azulejos, the Portuguese tiles found all over Brazil that are a legacy of its colonial past; and partly by Chinese ceramics, dating from the 11th century Song dynasty. The thinly painted plants have a more recent source – Louise Bourgeois’ late gouaches. They too privilege atmosphere over anatomical accuracy, aiming to provoke both desire and repulsion, hoping for a reconciliation of nature’s extremes. The drawings are too weak though, to command the paradoxical lure of disgust. The seven works on view were first shown as part of a much larger painting installation produced for her 2012 retrospective exhibition in the Museu de Arte Moderna de Sao Paulo. They are more like scattered tiles, providing only a fragmented notion of the larger, stronger structure to which they belong. ‘Adriana Varejão: Carnivorous’ is at Victoria Miro, Mayfair, until 2 August.